There is no doubt that the legendary figure of pianist / composer / bandleader Krzysztof Komeda, the Godfather of Polish Jazz, is still very much present on the local scene, more than forty years after his untimely and tragic death. Komeda's charisma, mystique, prophetic vision and above all his extraordinary talent as a composer keep his legacy alive generation after generation, with his musical heritage being passed on to the upcoming young Polish Jazz artists, as an integral part of the modern Polish Culture. 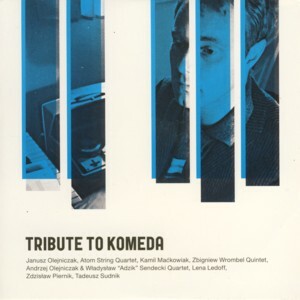 In the scope of those forty plus years since Komeda's death the Polish Jazz scene produced a plethora of recordings, concerts, festivals and other events dedicated to his memory. As a result the idea of commemorating Komeda has been overexploited and often even abused by lesser quality attempts, which result in blemishing his memory rather than uphold it. Fortunately this album is definitely not one of those damaging efforts; on the contrary, it offers many new and fascinating discoveries, as well as thrilling interpretations by excellent musicians, which treat the music with respect and obvious admiration. 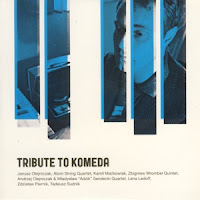 The album includes ten Komeda compositions, performed by several different ensembles: pianist Janusz Olejniczak with Atom String Quartet, bassist Zbigniew Wrombel and his quintet (drummer Krzysztof Przybylowicz, trumpeter Maciej Fortuna, pianist Piotr Wrombel, vibraphonist Karol Szymanowski) with actor Kamil Mackowiak, the duo of saxophonist Andrzej Olejniczak and pianist Wladyslaw Sendecki, the duo of tuba player Zdzislaw Piernik and synthesizer player Tadeusz Studnik and finally solo piano performances by Lena Ledoff. Such diverse settings are an ideal vehicle to present the diversity of Komeda's music and the endless possibilities, in which it can me expressed and interpreted. All the performances are truly superb, moving and deeply engaging and pay a fitting homage to Komeda's heritage. My personal preferences are the trumpet pats by Maciej Fortuna, the incomparable piano playing of my friend Wladyslaw Sendecki and the solo piano pieces by Ledoff. But each and every musician participating in this recording deserves full admiration and respect. The quality of these live recordings in not ideal, but neither is life, so true music lovers can certainly live with it and enjoy it immensely. The most interesting two pieces on this album are the early Komeda Jazz and Poetry compositions to poems by Jerzy S. Sito, known mainly for his work as translator, who died in 2011. Komeda's involvement with the Jazz and Poetry movement, presented by him during the 1960 Jazz Jamboree festival, is one of the most fascinating, but sadly neglected, milestones of his career. The two pieces were restored from Komeda's notes by the great vibraphonist / composer Jerzy Milian, who was a member of Komeda's group in the late 1950s. Honestly that entire program simply screams for proper restoration work. Overall this is a superb piece of music, which is worthy of an honorable place in any serious Polish Jazz music collection and should be of interest to the many Komeda followers all over the world. Brilliant stuff!